NewDEAL Founding Chair former Maryland Governor Martin O'Malley spoke this week at Sustainability Symposium 2017 in Orlando, FL, co-hosted by NewDEAL Leader Mayor Buddy Dyer. O'Malley's remarks focused on how cities and states can be leaders in the fight against climate change, and how climate change offers a unique opportunity to build new industries and create more resilient communities and economies. Read his full speech here. Governor Jack Markell's "George Bailey Moment"
In today's political climate, it can be hard to remember how elected officials' decisions, small and large, make a real difference. We share this light-hearted video from NewDEAL Honorary Co-Chair Delaware Governor Jack Markell as he prepares to leave office as a reminder - and a thank you - to NewDEAL Leaders and all those who work on public policy for your work to improve people's lives. 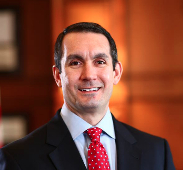 NewDEAL Leader Pennsylvania Auditor General Eugene DePasquale will host a workforce development and training meeting for residents in southwest Pennsylvania where a new Shell Chemicals plant will be built this year, bringing an expected 6,000 temporary construction jobs and 600 permanent jobs to the area. Learn more about how the meeting will help residents benefit from those new job opportunities.